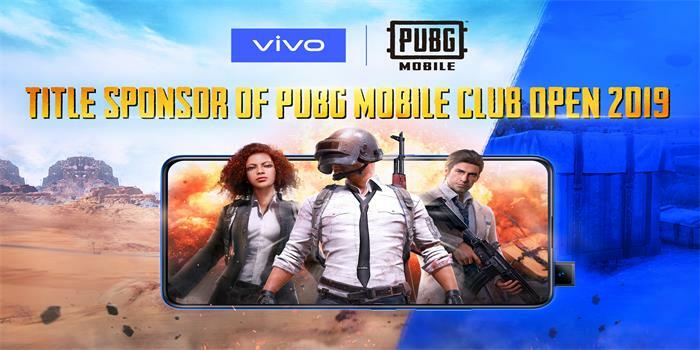 Vivo, the global innovative smartphone brand, today announced the launch of the vivo V15 for the Indian market. The smartphone will be available in 6GB RAM + 64GB ROM with expandable memory up to 256GB, running on a 4,000mAh battery with dual-engine fast charge. 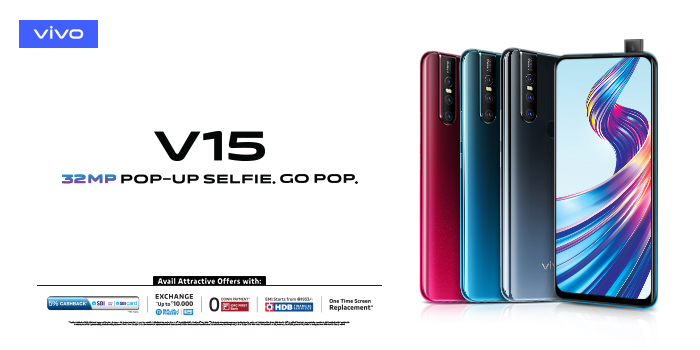 The V15 will be available in Glamour Red, Frozen Black and Royal Blue at an MOP of INR 23,990 on vivo India E-Store, Amazon.in, Flipkart, PayTm Mall, Tata CLiQ and all offline channels pan India from 1st April, 2019. 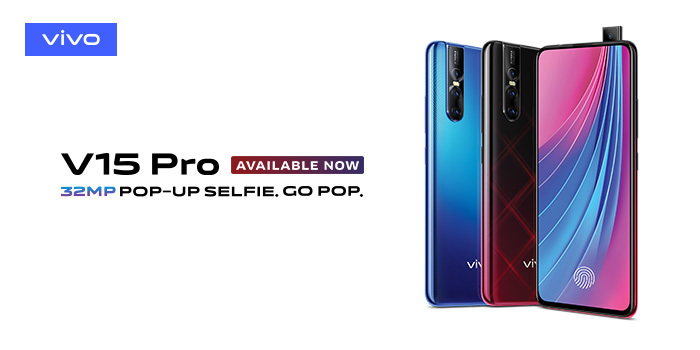 Vivo, the innovative global smartphone brand, today launched the V15 Pro in India, complete with additional flagship features such as the Pop-up selfie camera, AI Triple Rear Camera, In-Display Fingerprint Technology and Super AMOLED display in the V series. 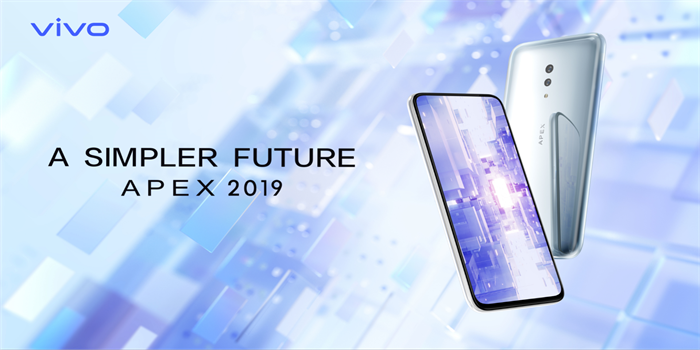 With an almost bezel-less 91.64% screen-to-body ratio and benchmark-setting features, the smartphone will be available in 6GB + 128GB at an MOP of INR 28,990. The device will be available for pre-order across offline and online channels including Vivo India E-store, Amazon.in, and Flipkart starting today. The Vivo V15 Pro will come in two color variants- Topaz Blue and Ruby Red, and will hit both online and offline stores on 6th March. 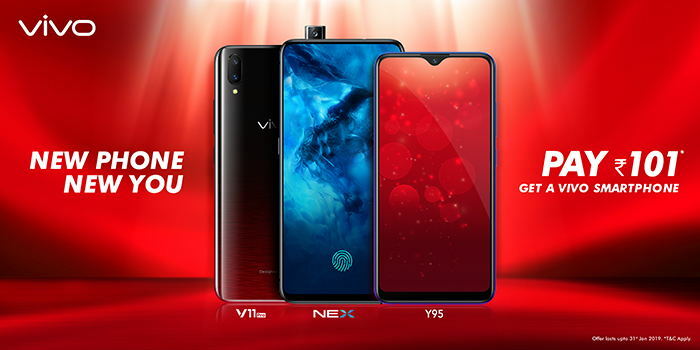 Vivo India, today announced an exclusive offline offer ‘New Phone, New You’ to celebrate the Christmas and New Year festivities. The 41 days offer period starting from December 20th 2018 – January 31st 2019 across all partner outlets pan India. With this offer**, customers can buy any Vivo smartphone above value INR 10,000* by making an immediate payment of INR 101 and paying the total amount in 6 equal EMIs. Vivo, the innovative global smartphone brand, is excited to announce the initialization of their second manufacturing facility in India. 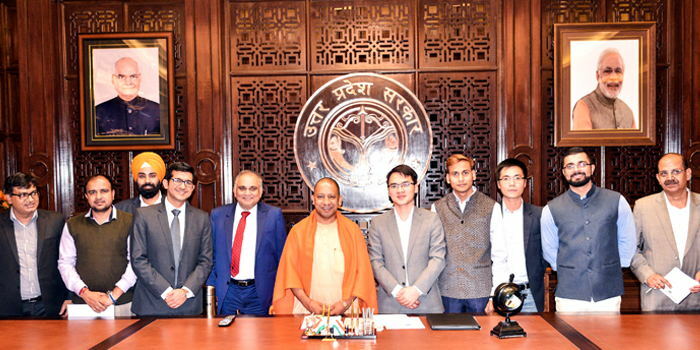 The company has acquired additional 169-acre of land in the Yamuna Expressway region in Uttar Pradesh with an estimated investment of INR 4000 crore (not including land cost). Hon’ble Chief Minister of Uttar Pradesh, Shri Yogi Adityanath welcomed the initiative and congratulated Vivo for the upcoming facility.